Arduino themselves have a wealth of information on installing the IDE on most operating systems in the 'Getting Started' part of their website. Be sure to read through this before continuing. Download the latest Arduino IDE here and click on the Mac OS X installer. This will download the Arduino app to the Download folder. After completion move the Arduino.app to your Applications folder. Note: If the file is downloaded as a ZIP file then double-click to uncompress. And then move the file to the Applications folder. If using Open Energy Monitor USB to serial UART Programmer, do not follow the instructions for installing the drivers on the Arduino website. 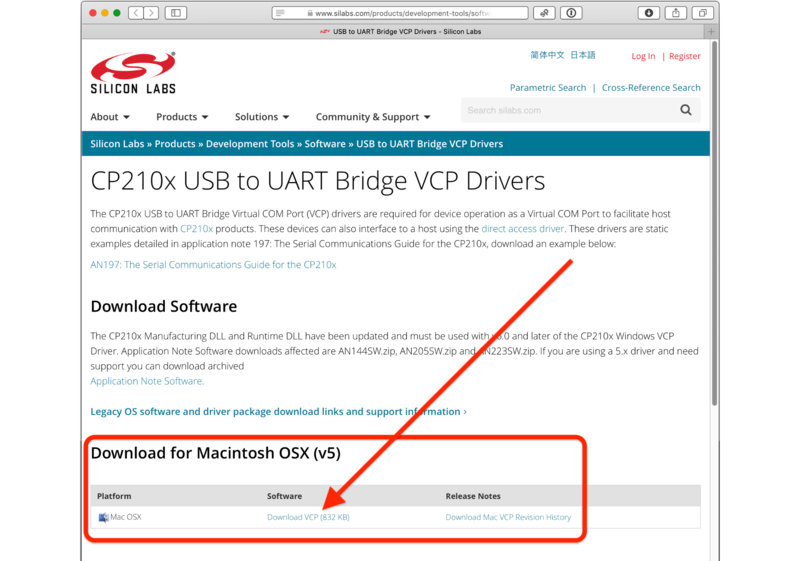 Instead download the CP210x USB to UART Bridge VCP Drivers. Click on Download VCP (nnn KB) and this will download the needed driver to the Download folder. Note: If the file is downloaded as a ZIP file then double-click to uncompress. And then install. 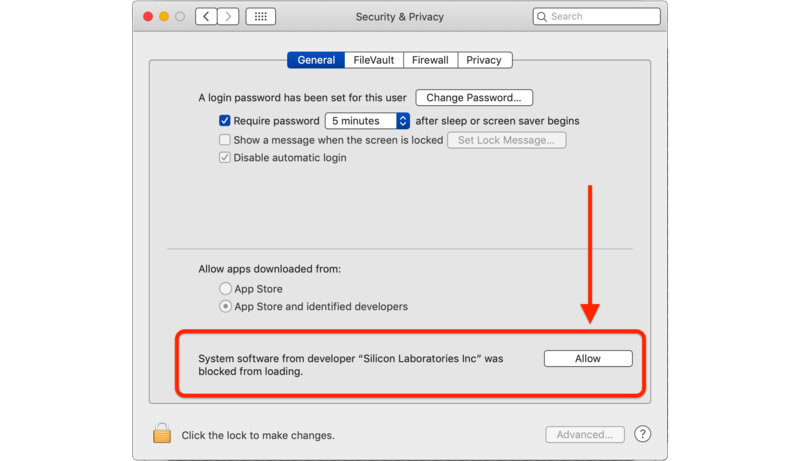 Open the Mac_OSX_VCP_Driver folder and double-click Silicon Labs VCP Driver.pkg to install the drivers. If the software is blocked a window will pop-up with instructions. Click Open System Preferences. Open the macOS System Preferences > Security & Privacy and click Allow. Make sure you restart the Arduino IDE after installing the drivers. Before connecting the programmer, check Tools > Port and make note of the available ports. Now connect the programmer and your module (emonTx, emonTH, etc). Go back to the main menu and select Tools > Port again. Port should be available and showing a new port. Select the port /dev/cu.SLAB_USBtoUART. And under Tools > Board ensure Arduino/Genuino Uno is selected. If you have a favourite text editor, you can use it instead of the built-in editor. Select File > Preferences and tick the box Use external editor. When you use an external editor, your workflow is slightly different. You must still open the sketch in the IDE, but the IDE does not open your editor - you must yourself open the sketch file in your external editor, and save the file when editing is done. Then you switch to the IDE where you can click Verify or Upload and the IDE will read the file again and then proceed to compile it (“Verify”) or compile and upload it (“Upload”). Read the section on Installing the Arduino Libraries – macOS before you set your Sketchbook location (under Preferences).